For this page I will tackle the topic of Where to buy Gunpla? I have two main stores where I buy my Gunpla kits locally here in the Philippines, they are Wasabi Toys and Great Toys Online. 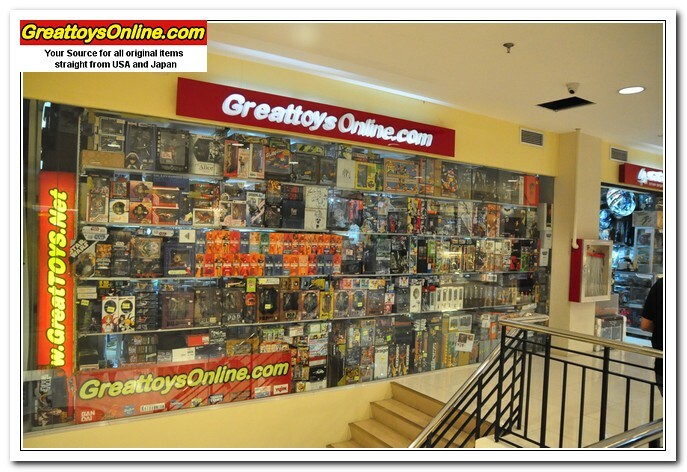 Wasabi Toys is located at Blue Lane, 3rd Floor Shoppseville, Greenhills. San Juan City, Philippines. They have a nice range of Japanese toys and collectibles to choose from, whether it be Figma, Nendoroids, S.H. Figuarts Kamen Riders or Gunpla kits. Wasabi Toys along with Great Toys Online, are among the most cheapest resellers (with outlet stores) of Japanese toys and collectibles in my country (that I know of). Other stores from the same mall and area would sell the same products at a much higher price (sometimes really, insanely overpriced!) and sell bootlegs which I really really hate!. They have a nice straight forward website design that you can easily navigate, find products you want, pre-order updates and new arrival updates. You can register and receive updates via email (like a newsletter) when new pre-orders and new arrivals are available, pretty convenient! Upon registration, you can also apply for pre-orders online as well! They usually participate in Toy/Anime Conventions and you can find them selling their available products there. (Above Daiso, Payless Shoe Store and Giordano in Shoppesville building). Its just beside Wasabi Toys! One thing I like about Great Toys Online (GTO) is their supply, they have a huge supply of Gunpla kits and other Japanese toys and collectibles! Although the main outlet store is a little cramped up and hard to go around, but hell if you want to buy a cheap HG Gunpla kit, I wouldn’t mind browsing through the claustrophobic aisles! You can apply for a membership card at their store too and avail of 10% discount on all their products for only 200 PhP for 2 years membership! That is helluva deal! 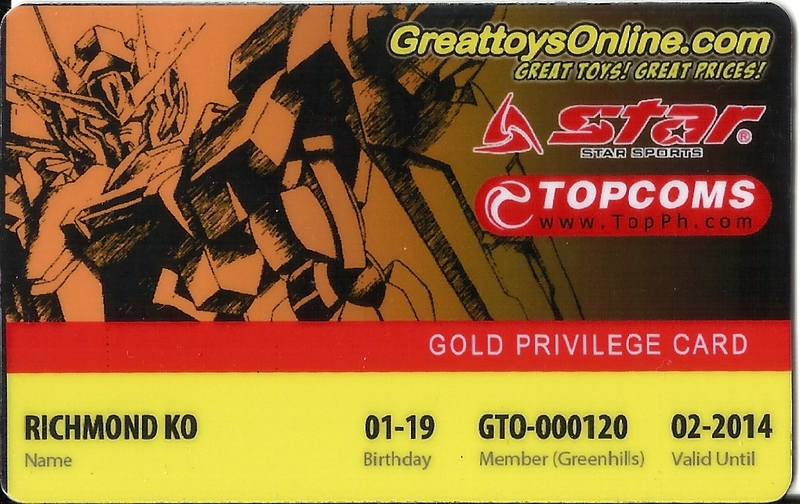 If you’re planning to buy something at GTO, better apply for a membership A.S.A.P.! Imagine buying an MG kit worth 3,000 PhP, you can get it for only 2,700 PhP instead! Saved 300 PhP that you can use for a snack, or better buy some Gundam Markers or paint if you don’t have one yet, its also enough to buy an action base! The membership card design is not bad too! You can avail discounts at other partner stores like Star Sports and TOPCOMS. There are other stores where you can buy Gunpla kits, but as I said earlier, they are already overpriced and some are stupid bootlegs! any updates this 2013 to where to buy gunpla? any stories about online stores,shipping etc? For me it’s still Wasabi Toys, Great Toys Online and Coldfire Gundam. So far GTO always has the latest pre-order of products. 🙂 Thanks! Hi, thnx sa tutorial sa GT kah dn pla bumibili. ahahaha. Meron ako nakita sa net nail buffer nmn ung ginamit para sa pag sanding. Meron po ba kyong tip para nmn sa mga clear parts, meron kc akong mga ibng kits nah clear lahat ng mga plates. Hi po gusto ko po sana magstart mag collect na ng gunpla student palang po ako planning to start sa mga HG ano po ma aadvice niyo? Supplier? Maybe Bandai. Most stores usually order from Bandai or other international online stores that sell gunpla kits. Then they buy in bulk and maybe have cheaper shipping options or 3rd party shipper. Kung local, not sure kung kikita ka if buying from other cheaper stores. you can also try joining pinoy gunpla community in facebook. well that’s cool thanks for replying! Now I’m going to wait for them to reply my texts can’t wait to order a bunch of them since I can Save a lot of money rather than buying at the toy kingdom the price of their gunpla is insanely HIGH! are they trusted sellers? the toybuilders? found new gundam online stores sa fb. heres the link updated on new releases pricelist..
Hi gusto ko po mgstart ng gunpla pede nio po ba aq bigyan ng tips at kung ano ung mga dapat bibilhin.. ty.. Nakita ko kasi un gunpla sa sm manila interesado aq mgbuild newbie pa lng po ako sa ganto kasi college student pa lang aq..
Hi Sir, I would like to apologize for being off topic. It’s great that you write a blog where we could get great deals on gundam kits. I would like to ask if you would be willing to spead the word on “hobbiworkz” mini compressors and airbrushes.. We gladly welcome it if you decide to make a blog about our products too..